Dear CNers, please, could those of you who own (or owned in the past) this instrument, share some of your experience with me in this thread? 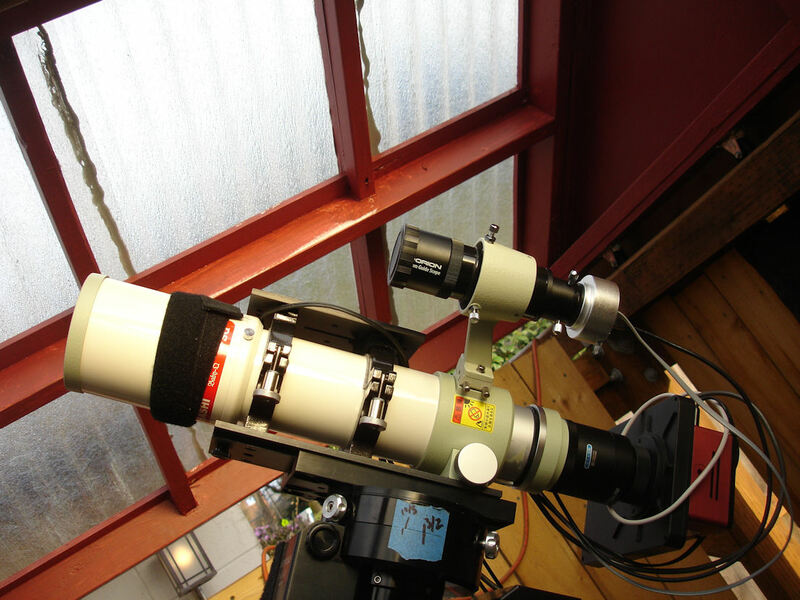 I put the main list of questions to the CCD/CMOS Astro Camera Imaging & Processing as I think most APers go only there... but for sure some of the others come to the Refractors page Thank you! My astrobuddy is going to return this week for the third time (!) his second copy (!!) back to the seller for a refund. The first time the scope was supposedly collimated as it was clearly something wrong with it, distorted stars even in the frame of the atik460's smallish sensor. After that the scope was still a mess so he returned it for a second time and the seller sent another brand new copy back. This was a little bit better but unacceptable for a scope costing 3.5k euros, his old 300euro celestron ed80 doublet was much, much better. Edited by Fomalhaut, 23 February 2019 - 05:49 PM. I’ve had my FSQ-85 for about 4 years. I bought it new at Land, Sea & Sky here in Houston. It is still perfect. I use a QSI with the 8300 chip with it and the QE reducer. Never had a single issue with the scope. With the reducer, I was able to frame the entire veil nebula in one image. I do not have the new flattener, as I only recently got a full frame camera that could work with the FSQ, so I can’t comment on its full frame functionality. I have the STXL-11002, but I never even considered putting that monster on the little focuser of the FSQ. I am pretty sure that camera weighs more than the FSQ. With a modestly sized CCD it will be fine. And will provide excellent images. With a larger CCD you will want to upgrade the focuser to a Feathertouch or even a Nitecrawler. I upgraded mine to a FT.
Are APM LZOS and TEC Chinese brands? I didn't know that! LZOS is Russian, they make their own glass blanks in house. I believe their are some APM scopes that may have Chinese optics, but they won’t say LZOS. I don’t know where TEC gets there glass. I had great success with mine after much tweaking. Maybe to some an excessive amount. I was doing narrowband long exposure in the city here, using an SBIG 8300M with Astrodon filters. These images pretty greatly minimized to post here but the original are detailed enough to survive enlargement to 24" x 36" poster size. Most issues fall into focuser category, an increasing requirement to have everything orthogonal as focal ratio gets smaller. Part of my 'tweaking' was to remove the rotating 'caa' from the focuser. Here is the rig that made those. 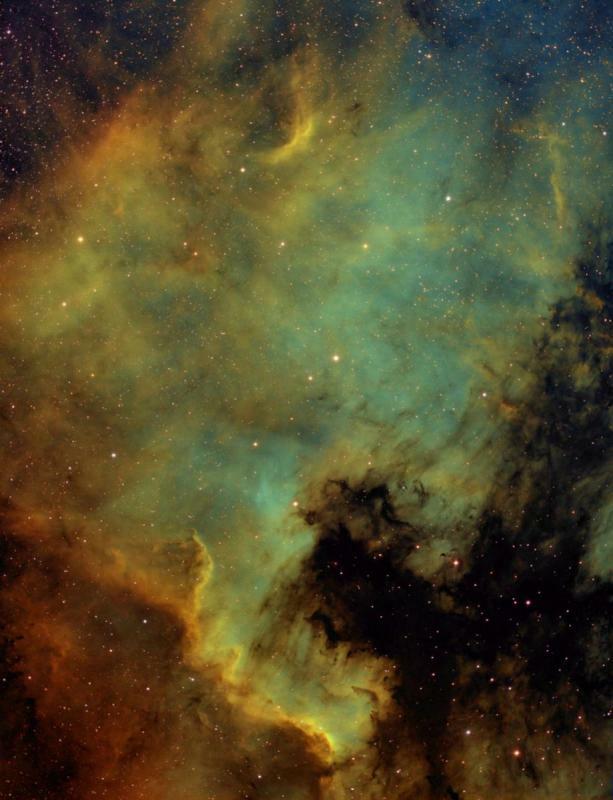 Here is a four panel mosaic... again monstrously reduced. Lots and lot of 20 minute sub exposures. All these images I've posted are for me 'heavy lifting' as i required at least sixteen 20 minute sub exposures per filter, so times three. Per each panel, so that times 4... So it did some heavy lifting and I have a lot more images than these... Should add it was mounted on an A-P Mach1 on a concrete reinforced pier. Notice also the 'D' plate and rings setup, the clamps are on riser/spacers. Safe for all impacts except a garbage truck. again, and I cannot emphasize enough, the detail of the originals makes for easy enlargement to 24" by 36" poster size, and they are very impressive. Or viewed on hi res projection or your home viewing option. I tried a few scopes of smaller aperture and with my CCD I was not happy with the 'figure eighting' of dense clusters under 85mm and f /5.x, but that is just me. CounterWeight, those are very nice images. I am going to pair my TOA with one of these little beauties in the future. I see you already have a Mach-1, so you are all set there!... for imaging the hassle factor hugely dampened when you don't have to worry what the mount will do on any given night. Mach-1 is a great foundation. Most issues I had over the years where because of either the mount, the focuser and CD orthogonality, my learning how to image. In that order. I did not start with a Mach-1.... Starting with good data is a world different when it comes to processing, the processing paths available. an EM400 Tak , I know a lot of people rave about the Avalon T130 , but unfortunately it fails to impress me with my larger scopes. Looking forward to put my hands on the baby Q , but first I need to solve the tripod. I am mobile only so piers etc on not always even ground not a good choice. I really like those images you shot very very impressive. I used a Berlebach planet tripod with the baby q setup, worked very well. Also thanks for the compliments on the images.! Edited by CounterWeight, 01 March 2019 - 01:23 PM. I am still trying to figure out a proper tripod for it though. My Mach1 sits on a Berlebach Sky tripod and this combination works great. I am not a fan of wooden tripods unfortunately, I had the uni, which was a good tripod for visual with lighter scopes and I am sure the planet is way better, however I think the Losmandy HD for example is hard to match in terms of stability. I had no issues in windy conditions with that, yet the T130 is clearly not able to hold even light winds ( collapsed TOA ). My only issue with the Losmandy was that it was way too heavy for my tastes (flight of stairs every time I go out ) so as I sold the G11 I let it go with it. Funny now I might have to get one and deal with the weight or jump in deep water ($$$) with the EM400 that actually has all the sturdiness with about 10 pounds less muscle. Not sure what to do yet, at the end it will be between these two pending my finances allow for the latter. Edited by balu01, 02 March 2019 - 04:00 AM. I've got both Berlebach Planet and Eagle Pier for my Mach1. Both seem to be very adequate for long exposure imaging, but I prefer Eagle Pier for imaging as it feels even more sturdy (possibly just my subjective impression) than the Planet which is fantastic anyway. I had the original AP wood tripod for my Mach1. Not stable enough for my tastes. I now have the Eagle Pier and it is rock solid. Handles my FS-152 for imaging just fine. The EM-400 is rock solid, especially with the Tak Heavy Duty metal tripod. To be honest, I haven’t used my EM-400 since I got an used AP-1200 to handle a 14” EdgeHD with Homeyer scope cradle (~75lbs tube and cradle). Edited by Esso2112, 02 March 2019 - 09:16 AM. and uses a large CCD/CMOS chip. I wonder what is the vignetting like in the very corners of a 36x24mm chip. Also, I may appreciate the same for at least APS-C or maybe also a KAF-16200 could give some "hint". do you know anyone who owns FSQ-85? and uses it for imaging? I am willing to pay 10 EUR or 10 USD per sample (best focused single light frame + flat field) via PayPal to your account. The data may save me $$$ from buying this setup. Thank you! Please, may you know someone with a new FSQ85 (ED/P/X) try to ask him/she, many thanks to all you folks! if you can't provide any large chip data, but would like to "help me" to decide, I may be also interested in those of you who use the 85 with the 0.73QE reducer on an APS-C chip (or 16200). Knowing how good it can be focused (how good the stars in corners of your chip might be) and knowing the vignetting plot is very important to me. Thank you! I ordered a FSQ-85 from Telekop Austria. As a service I asked to fully test and adjust the scope before shipping. Tommy Nawratil was very helpful during the whole process. 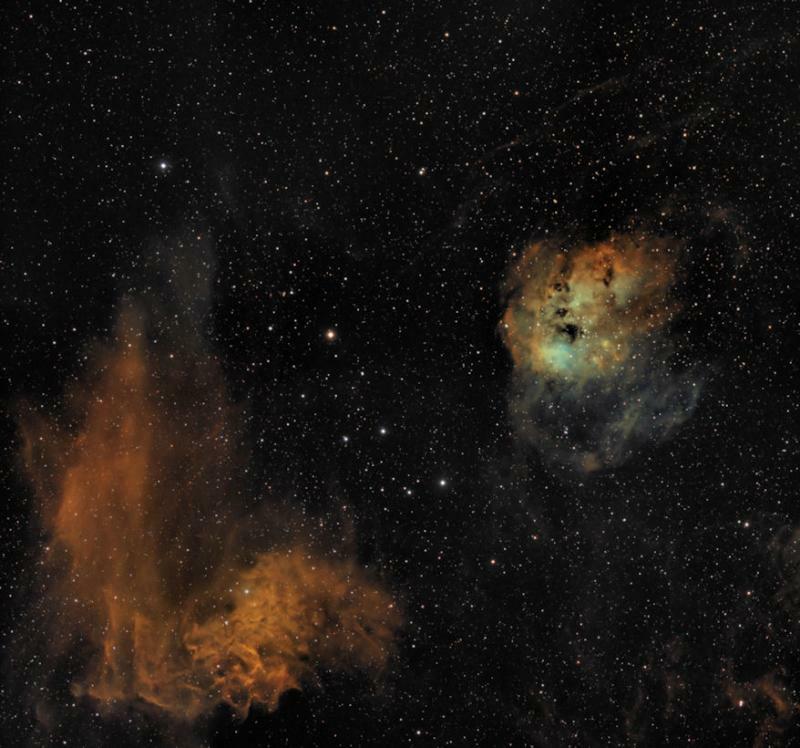 Images were made with APS-C size and EOS6D 35.8mm x 23.9mm chip. Both with flattener and also with 0.73 reducer. I am happy with what I see and hopefully the scope will arrive in a couple of days. Edited by Christian-UAE, 10 March 2019 - 07:36 AM. Hi Christian, yes I am in contact with Tommy for a long time already... he's a very nice guy to work with! These images are new ones(!) these haven't been there on their web few days ago... thank you. 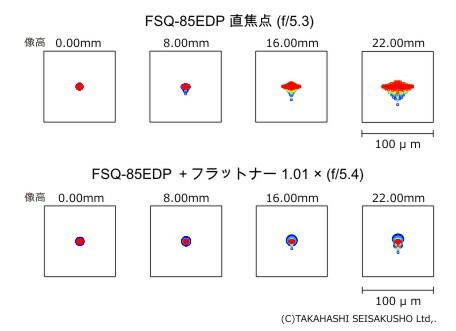 I lean towards purchasing the FSQ-85 even though there are "issues" with it (potential focuser issue - will be replaced by FTF by Tak EU, butterfly stars and it's a slow F/5.4 instrument). 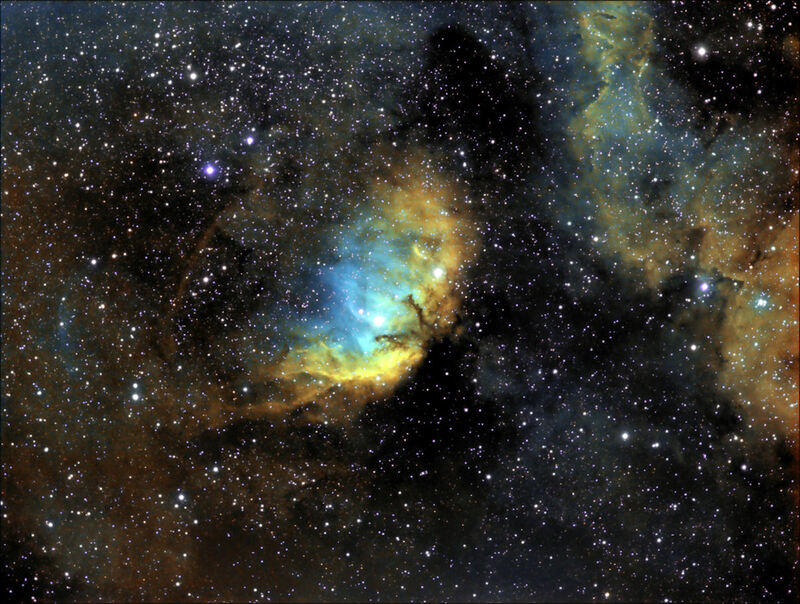 Reason is that there simply isn't anything "better" in the portable astrograph (pocket size, < 5kg, < 50cm) that could in any way even be usable for a full frame camera... and I already sold my old Borg77EDII (F/4.3) perfect stars on full frame, no tilt, no focuser issues, but really BIG vignetting and very notable CA. thank you! and sorry that I am a pain in the "back" as my demands are higher than what can be delivered (with refracting optics). Edited by Konihlav, 10 April 2019 - 04:40 AM. Would you share what are the shortcomings that you seeing in these images that render the scope to you only acceptable quality? I would say take a look at Sara Wager’s work. 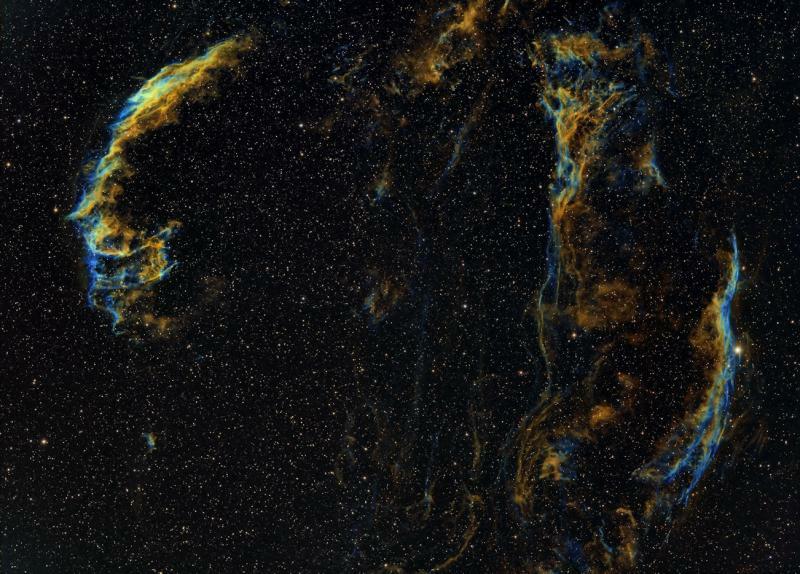 She has been using the FSQ85 for her narrowband imaging for a long time.